The Dodgers finished off the season on a grand note. They sweeped the Padres to record their best home record in LA Dodger history, going 55-26. 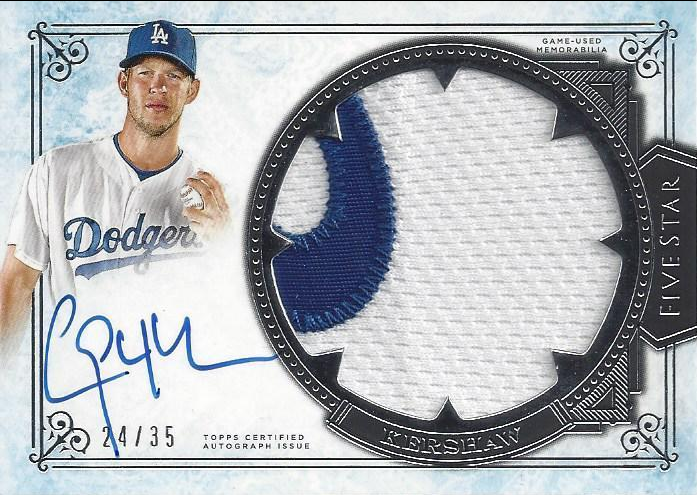 Clayton Kershaw threw seven strike outs to become the first pitcher in thirteen years to reach 300 - he finished with 301. 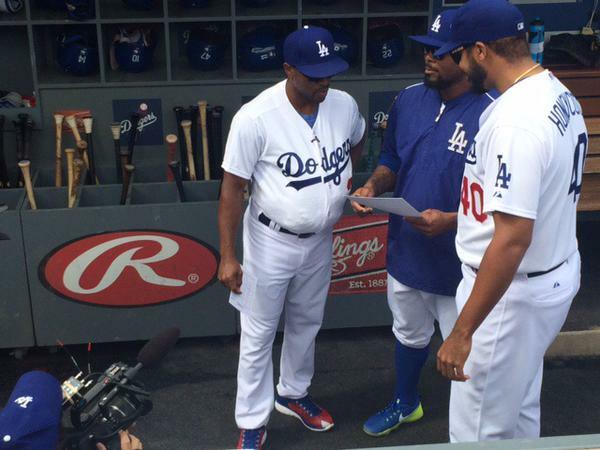 And, to top off the last game of the season Jimmy Rollins was named the surprise manager of the game - going so far as to wear Lasorda's #2 uniform and sporting a portly belly in his honor. Check out the great photo above, tweeted out by the Dodgers, showing Rollins and the guest pitching coach Kenley Jansen - who wore #40 in honor of Rick Honeycutt. Rollins talks about it here. Go here to check out some great photos from Dodger photographer Jon SooHoo of the last game. 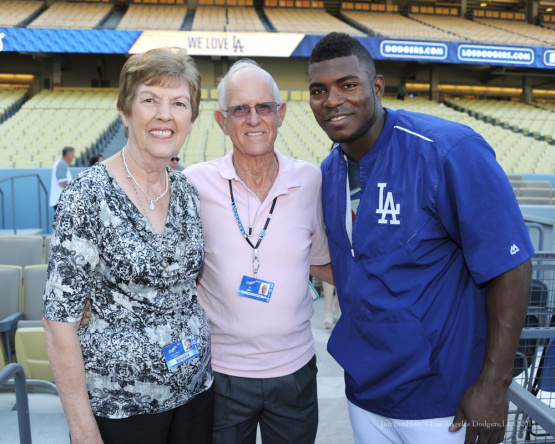 Below, Yasiel Puig takes on final moment to get a photograph with Nancy Bea Hefley and her husband. Photo via Jon SooHoo/LA Dodgers 2015. Via Adam Rubin at ESPN, "New York Mets set rotation for NLDS vs. Dodgers." Jacob deGrom will start Friday's opener at Dodger Stadium, likely against Clayton Kershaw. Noah Syndergaard then gets Game 2 in Los Angeles, followed by Matt Harvey in Game 3 when the series shifts to Citi Field, manager Terry Collins said Sunday. No surprise here. Via Steve Dilbeck at the LA Times, "Dodgers give rookie Corey Seager short notice he's a starter." "They're going to play him," Rollins said. "We had a conversation and that's the way it was said: 'We're going to go with the kid. That's the lineup we feel is best.'" Via Matthew Moreno at Dodgers Nation, "A.J. Ellis Values Consistency Heading Into Postseason." “We got to pitch to our strengths, pitch to our game plan and at this stage in the game, it’s about execution.” While Mattingly has used various lineups throughout the season, the one in Friday’s game resembled what may take the field in the postseason. Via Ron Cervenka at Think Blue LA, "Turner’s power surge couldn’t come at a better time." Nick Diunte at Examiner.com writes a book review on "Clem Labine: Always a Dodger" Richard Ellott. My brother was shot 3× this morning by a mentally unstable person...We don't need gun control. We need Mental Health Control! Congrats to Dee Gordon for winning the NL Batting crown. He also become the first person to lead the league in batting and stolen bases since Jackie Robinson in 1949. Below is a tweet from the Marlins celebrating his achievement.